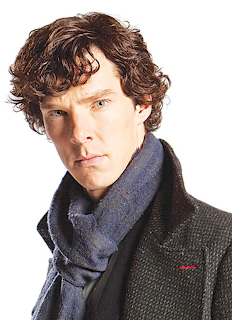 A: Benedict and Martin are both on board for the third installment of the hit British mystery series — as Sherlock Holmes and John Watson, respectively — with “Sherlock” scheduled to begin airing new episodes in early 2014. You also can see them both together on the big screen (again) in the second and third installments of “The Hobbit” trilogy — as the Necromancer and Bilbo Baggins, respectively — when “The Hobbit: The Desolation of Smaug” hits theaters on Dec. 13, 2013, and “The Hobbit: There and Back Again” on Dec. 17, 2014. If you want to see them earlier than this, then I suggest watching (or rewatching) Benedict's outstanding performance in "Tinker Tailor Soldier Spy," alongside the all-star cast of Gary Oldman, Colin Firth and John Hurt. And my all-time favorite Martin project has to be the U.K. version of "The Office." The writing is sharp and witty, the acting is aces, and the chemistry between Martin and series star (and creator) Ricky Gervais is phenomenal. A: “The Curse of Chucky,” which premiered at Montreal’s Fantasia International Film Festival earlier this month, will be heading to DVD on Oct. 8. Brad Dourif once again provides the voice for the homicidal doll, while his real-life daughter, Fiona, stars in this sixth movie of the horror franchise. A: TNT’s execs and fans of the apocalyptic Earth-saving, alien-battling show feel the same way you do. The Noah Wyle-starring series, which wraps up its third season Aug. 4, has been renewed for a 10-episode fourth season to air summer 2014.